The GIS-based asset management system includes catch basins, manholes, conveyance pipes, culverts, and dry well systems. Custom forms were created to use on the division’s ArcPad devices in the field for remote data collection. The department’s predictive models are maintained by ArcGIS. In 1853, the United States formally designated Washington Territory out of the existing Oregon Territory so that the US federal government could better administrate its western region. An aspect of this reorganization was the division of the new territory into smaller legislative districts. Pierce County Public Works Road Operations uses ArcGIS to manage the county's core assets. Drainage layers can be seen in the image along with attributes. To open up the West for greater access to the rich natural resources there, the Northern Pacific Railway was constructed, connecting the Great Lakes in the northeastern part of the United States with the deepwater harbor of Pierce County’s Commencement Bay on Puget Sound. The completion of the rail line in 1883 stimulated the migration of people from the eastern United States to the western territories, and the region began to grow rapidly. Today, Pierce County has a population of about 800,000 residents. It is 1,700 square miles in size, 1,300 square miles of which are unincorporated. With a road network of approximately 1,600 miles, the county’s Public Works Road Operations Division oversees management and upkeep, including pavement condition, billboards, medians, gates, and vegetation. Pierce County has used ArcGIS for years. ArcGIS is a county standard, and the software is used across the enterprise. The Public Works and Utilities and Public Works Road Operations departments use ArcGIS to ensure that data acquisition needs continue to be met and to help meet and exceed optimal service levels. The versatility of ArcGIS solutions have allowed these departments to effectively stay in compliance while regulatory issues continue to rise. Each year, teams of Public Works Road Operations employees visually inspect, evaluate, and record the condition of the entire roadway infrastructure in the county. The collected data is then fed into the department’s asset management system, which maintains all the data regarding the location and condition of the county’s road-related assets. The data also populates the county’s maintenance management system and drives the annual maintenance and operations schedule for the department. 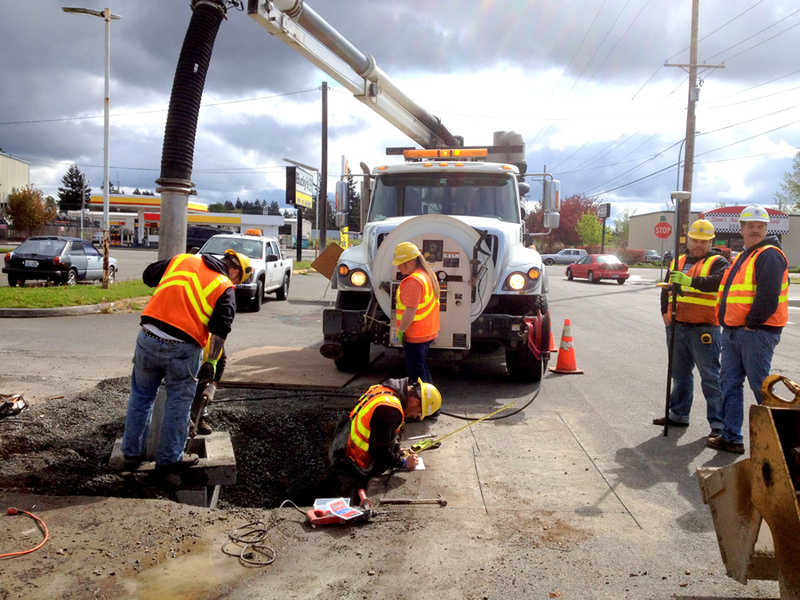 A Pierce County Public Works Road Operations crew multitasks as they perform a targeted annual storm drainage structure cleaning alongside a maintenance crew performing a needed repair to the storm water conveyance system found during annual inspections. A work order was immediately generated when the inspection data was checked back into the file geodatabase because the value entered into the custom ArcGIS form triggered the activity. The asset management system provides managers and senior technical staff with access to all county infrastructure data. A huge benefit is that Maintenance and Operation Program managers can get a quick status review on the overall health of an asset and then take action when necessary. Work orders can be adjusted to trigger a repair or replacement based on the department’s predictive models. For budgeting purposes, the asset management system also maintains cost-per-function (CPF) calculations. The CPF determines the total cost of labor, materials, and equipment needed to repair or replace a particular asset. “Over the last several years, we have collected hard data that has allowed us to significantly improve our predictive maintenance and deterioration models, which we find more efficient than the scheduled maintenance approach,” says Isun. The department’s predictive models are maintained by ArcGIS and include its Rating Assessment Information (RAI), which stipulates federal and state levels of maintenance standards for public works assets. The RAI contains a comprehensive collection of specifications ranging from the amount of sediment allowed in a catch basin to the Americans with Disabilities Act regulations for curb ramp slope. Using the predictive models helps with both the budgeting and prioritization of remedial maintenance work. The models have also helped reduce the life cycle costs for Pierce County’s road assets because they make it easier to identify assets that are potentially in need of repair or replacement. These costs include all expenditures from creation to replacement or disposal of an asset. “We work hard to keep our costs down,” says Matt George, GIS programmer/engineer, Pierce County, “and using in-house technical staff for development is one of the key strategies we use to control spending and avoid project scope creep and budget overruns. 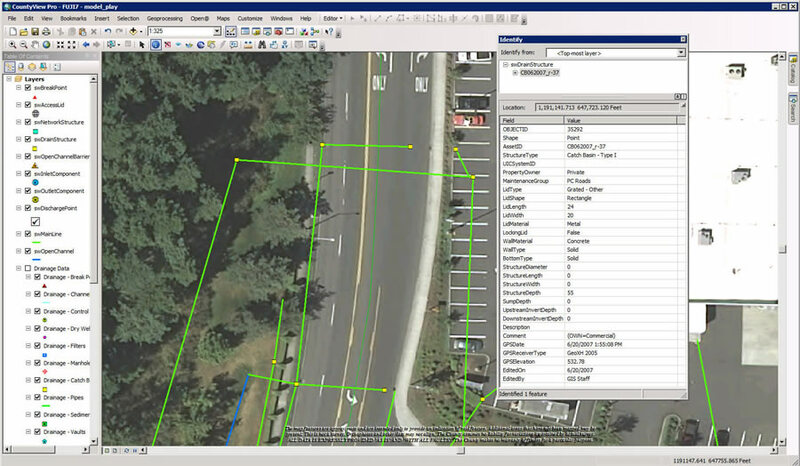 For example, our internal Public Works Road Operations Division did the design and programming of the database for our asset management system, as well as the creation of the custom forms.” The forms are used on the division’s ArcPad devices in the field for remote data collection and work in conjunction with a check-in/checkout process through ArcGIS. The department uses its maintenance technicians to collect the data for annual asset inspections. Because the technicians normally install and maintain the county’s complex roadside assets, they are very familiar with them and can perform the inspections in a quick and cost-effective manner. In addition, by being trained to collect the asset data, the technicians are not only more involved in the entire maintenance process but are also developing skills that can be applied to other employment within the department if they choose to advance their careers. For more information, contact Matt George, GIS programmer/engineer, Pierce County.